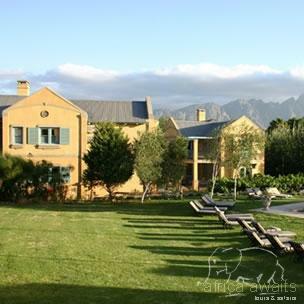 Set in the picturesque wine-producing valley of Franschhoek, the Franschhoek Country House & Villas offers luxury and indulgence. Set in the picturesque wine-producing valley of Franschhoek, the Franschhoek Country House & Villas offers luxury and indulgence. This restored manor house and former perfumery dating back to 1890, is situated on the outskirts of the village in the Cape wine lands and is surrounded by enchanting vineyards and majestic mountains. An hours drive from Cape Town makes it the perfect getaway for anyone visiting the Western Cape. Lunch is served on the magnificent fountain terrace and dinner in the relaxed, yet elegant dining room. The wine list emphasizes some of the top wines of the region. A complimentary sherry can be enjoyed in one of the guest lounges alongside a crackling log-fire, creating a welcoming atmosphere in winter. Attention to detail and friendly personal service completes your experience at this fine country retreat. The Country House offers 14 luxury rooms - Large room with lounge inside each room, fireplace, air-conditioning, mini-bar, tea & coffee making facility, en-suite with shower & bath, some with balcony. (Average size approximately 48m2) The new Villa Suites offer the ultimate in luxury. 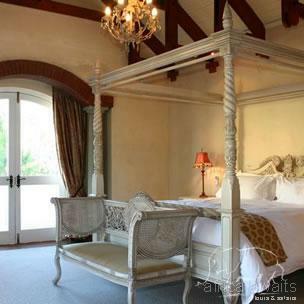 Franschhoek Country House now offers an additional 12 exclusive Villa Suites. Each suite measures a 100 sqm and consists of an entrance portico leading into a large, well appointed lounge. French doors leads you into the luxurious bedroom and both rooms open onto a large private balcony. The bedroom also has a second intimate private balcony with views over the lush gardens. Each bedroom has a beautifully fitted en-suite bathroom decorated in a French provincial style. Monneaux Restaurant Set on the original site of Franschhoek's first parfumerie, today its the heavenly scent of chef, Adrian Buchanan?s cooking that inspires at the Monneaux Restaurant, a Cape culinary classic. Even by the food & wine capital of the country?s high standards, Monneaux is an extra-ordinary success, having been in the country?s Top 100 list for six years consecutively, on the Top 10 list for two years and, last year, won the American Express Platinum Award for fine dining. 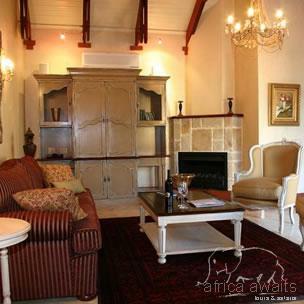 With your holiday, safari or business trip from in to Franschhoek Country House & Villas in Cape Winelands.